Back in March my graduate advisee Sharon Wang won first prize in the 2013 Penn State Graduate Research Exhibition. He credited Sharon’s winning entry with inspiring his poster design. For those who do not have time to go through them, below is a short summary. It’s far from perfect, but is perhaps a good start. First things first, know your audience. This determines how much technical details or basic introduction your should include in your poster. A poster for general audience from many different disciplines will need a good amount of background information and should avoid the use of jargons, whereas a poster for a specialized meeting (like the ExoClimes, or Kepler Science meetings, for instance) needs very minimal amount of general introduction, and can include commonly used jargons. A poster is a graphical representation of your abstract. People usually only spend 3-5 minutes on a poster, unless they are particularly interested (then they will likely talk to you for more details). So the goal of a poster is to make it easy to scan over quickly and leave one or two take-away points for readers to remember, or to open up a dialogue for those who are interested. Your poster is a visual aid for your oral pitch. Keep it simple and clear. Include only what is absolutely necessary. Use bulleted lists whenever possible. Use fewer words (<250-300) rather than a lot of them. Less is definitely better! A short title that clearly describe the main point/topic of the poster (Do not use all UPPER CASE type for titles). List of authors and affiliations. Introduction (What is it about? Why is it important? What are the objectives?). Observations/Methodology/Data Analysis (How do you do it?). An abstract is not necessary. I used to include abstracts to my posters. Usually, it is just a copy of the abstract I submitted to the conference. However, I now realize that since a poster is supposed to be an illustrated abstract, with the goal of making it easy to scan over quickly, it is kind of redundant to include a real abstract. It certainly has lots of text to read, which is what you want to avoid for posters. Use short sentences as section titles if you can — this is a tip I learned recently from Dr. Julia Kregenow’s teaching class at Penn State. A short sentence can briefly summarize the major point of the section, thus is often more descriptive and effective than simple section headings like “Introduction”, “Results”, or “Method”. This tip is also very useful for powerpoint presentations. Make the flow of a poster simple, intuitive, and easy to follow. Use sufficient white space around text and sections to ensure a clear layout and flow. Use sans serif fonts (Helvetica, Arial, Calibri, etc. are acceptable — font snobs will have better, harder to find recommendations) Use fonts big enough for people to see easily at a distance of 1 – 1.5m (40-60in). Headings and other text having the same level of importance should be the same font size. Use bold face or italics or combinations to emphasize words and phrases. Used left-aligned, ragged-right text. Using fully justified text will create large gaps between some words and make it difficult to read, especially for captions or text in a narrow text box. Use colors to engage readers. But no more than 3-4 colors. Too many colors make it look chaotic and distractive, but having no color makes it boring and not attractive . Also remember that a lot of astronomers are red/green color blind. So choose colors carefully so that they actually help the poster presentation. Choose good contrast between background and text. Avoid using bright background colors and low contrast text, like blue on red, dark on blue, dark on red, etc. A general rule is to use dark type on light color background and keep the contrast high. Stay away from backgrounds that are too busy or too colorful, since it makes text hard to read. Often times a solid tone, or a very simple gradient is a better option. A white background seems simple but works very well too. A picture is worth a thousand words. Graphs and figures are a great way to convey information effectively and attractively. Make simple figures. Label them well. And use big clear fonts. Don’t make readers stand on their head to read your data. Use high resolution figures. PDF and EPS figures usually come out great on posters. Again, consider the color blind when possible. Finally, choose a good software for poster making. Adobe Illustrator is a great tool to make fancy posters. It manipulates PDF or EPS figures easily. But it may not be available everywhere and the learning curve could be a bit steep. Powerpoint is a good and widely available tool, and it is very easy to use. Astrowright group members Jason Curtis and Kimberly Cartier both won AAS Chambliss awards for their posters following these guidelines. 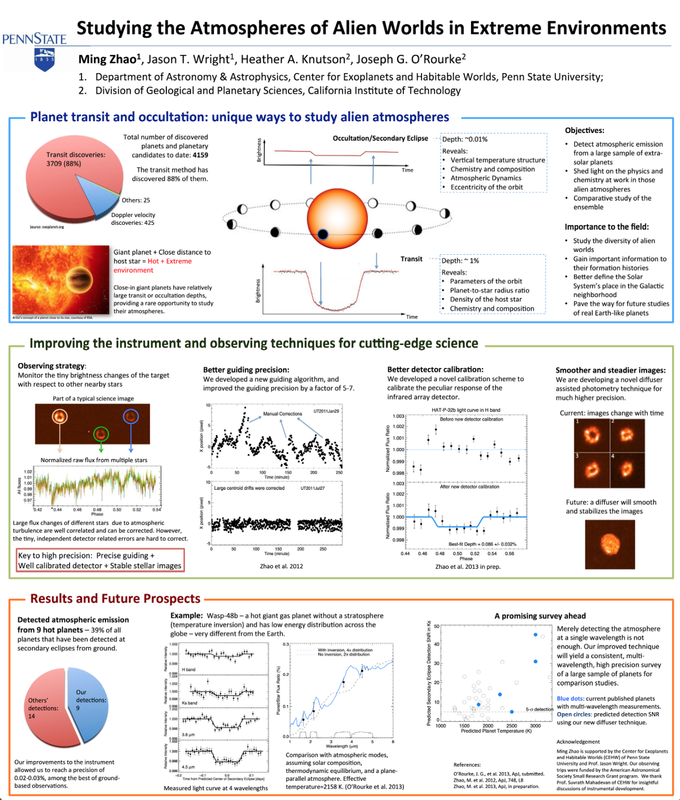 You may also find Kimberly’s “meta-poster” on the topic useful, as well as her more general science presentation poster here. This entry was posted in science, Uncategorized and tagged science on September 17, 2013 by jtw13. One extra thing I would suggest is to add a photo of yourself. That way there’s less of a need to spend the whole poster session by your own poster. People can find you if they have questions – obviously make sure it’s a current photo that clearly shows your face. This is a beautifully designed poster, and all your points are dead-on. What you’re essentially saying, in my words, is that a potential reader cruising down the aisle at the AAS is overwhelmed by so many posters, a fair number of which are relevant to them. You need good clarity from a distance so someone can tell what it’s about, and then maybe three key points that you make dreadfully obvious. Bear in mind (as you have) that poster readers are often 4-6 feet away from the surface if there are already some people there. One more minor suggestion about posters in general: I make up the poster in PowerPoint because it allows variable page size (believe it or not) and then when I’m happy I send it to FedEx for printing. Most convention centers have a FedEx place you can pick up, or they’ll deliver. Saves schlepping those tubes onto the plane. It may sound expensive (~$120), but first find out how much it really costs to run that giant printer at your institution. A lot of good advice, but I have one comment: left-aligned, ragged-right text isn’t always better than justification. It’s just that most layout software can’t auto-hyphenate, without which justification does look pretty bad. This is a big reason we’re still using TeX! If your software can auto-hyphenate and the text box is decently wide, justification is easy to read and looks much better.